Step #1 Gather information from the client about the content of the commissioned painting: what type of scene as well as time and type of day. Step #2 Review support material (photos and plein air studies). Decide on the pencil sketch size and draw several compositions before choosing the final one. Step #3 Study: The painted study is in the exact proportions as the pencil sketch and the final painting. The composition is drawn on the canvas with brush and ultramarine blue as you see in Photo #1. The additional photos posted here show the progress of the sketch. The sketch can make or break a commission so I work on it the same way I would any other painting. The finished study could also be considered a miniature painting. The wash color chosen depends on the scene and time of day or night I will be painting. Example: A beautiful, sunny clear mid afternoon could have a white or ultramarine wash. Early morning could have a light pinkish color. Early evening a golden color. But sometimes I will use a contrasting color. Remember there are no rules. My pencil sketch and painting study are the same size as shown on the right. If you are good at math you can reduce the sketch size to what will fit in your sketch pad. I always draw the composition on the canvas with a brush using ultramarine blue. You can see the hash marks around the edges that correspond with the hash marks on my pencil sketch. I will post photos of the study at various stages of development, so stay tuned. If you have any questions just click "comments" and post. Today was a first for me....my first air boat ride. I know it is a bit odd for a native Floridian, but my only excuse is that I am a city girl - born and raised in the big metropolis of Miami. I am delighted that friend and Gainesville artist Eleanor Blair invited me to join her on a tour of the Oklawaha River guided by Forest Service Rangers Ray Willis and Bobby Grinstead. Although leary of very fast air boats I figured I was in good hands with these professionals. The day was perfect, enough cloud cover from time to time to make it tolerably cool and no one else on the water. Didn't see much wild life, which was not a surprise with the loud fan motor on the boat propelling us around bends in the river. Bobby did a good job of driving, cruising down the river and slowing at picture perfect spots. I took at least a hundred photos and I am sure Eleanor took even more than that. Who knows, maybe we'll have an exhibit of our paintings from this trip sometime in the future. I have two commissions going at the same time, one farther along than the other. So, I thought some of you might like to see this one from start to finish. Remember, this is how I work, the process being developed over about 20 years. It may or may not work for you but will perhaps give you some pointers on developing your own way of working. Step 1. Get a clear idea about the content of the painting and the finished size. If it is to be a painting for myself this is purely what I want to paint and the size I need. If a commission, I have in depth conversations with the client about the size and content: time of day, lighting, etc. They look through catalogs of my paintings to help them formulate their ideas. After a lot of conversation I develop a pencil sketch to show them my interpretation of their thoughts expressed to me. I have plein air painting field studies as well as photographs that I have taken to use as support material. I never copy a photograph, but take elements from several to create the final composition. 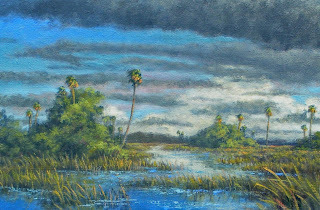 The painting you are following here is being developed from a number of photos of Cedar Key. They all were taken on a beautiful sunny day which presents another challenge....changing the sunny day into a dark, stormy afternoon that the client wants. The pencil sketch is drawn to scale. In this case the final painting will be 24" x 36" so, my sketch is 8"x12" or 1/3 the size of the final painting. Each 1" on the sketch equals 3" on the final painting. Yes, I actually mark off each 1" and number them as you see here. When I get to the large canvas every 3" is marked and numbered on the sides just like the sketch. I do not draw graph lines. I just "eyeball" an element in relation to the numbers. I am awaiting on the approval of this sketch. When I get the approval to continue I will post the painted study as it progresses. Go to my web site to see more of my work. 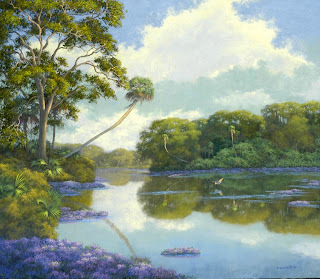 Closing Sabal Palm Gallery in Ocala gave me a since of peace and I was looking forward to a quiet, lazy summer. I have a full inventory of paintings that I had created to fill the gallery so I am good to go for the fall show season...no pressure as in past years. Somehow my life got crazy all of a sudden. First, my husband and I decided to take our two older grandchildren on a two week trip in our camper (I will tell you about that later). Then the calls came in. In my last post I told you about a second commission for a collector. I had secured the commission before I left so, when I returned from our "camping trip" I began work on sketches for the 30"x46" painting and will post photos soon. Another painting has been commissioned. This one is 24"x36". The collector is very specific about the content, which is helpful. I told him it would take a while because I am currently working on a commission....he was ok with giving me the time I need. I just received an email last week from another collector who has ordered a 30" x 40" painting for his newly built office in West Palm Beach. He understands my prior commitments and is willing to wait for the painting. As the saying goes "when it rains it pours". Believe me I am not complaining...just explaining! 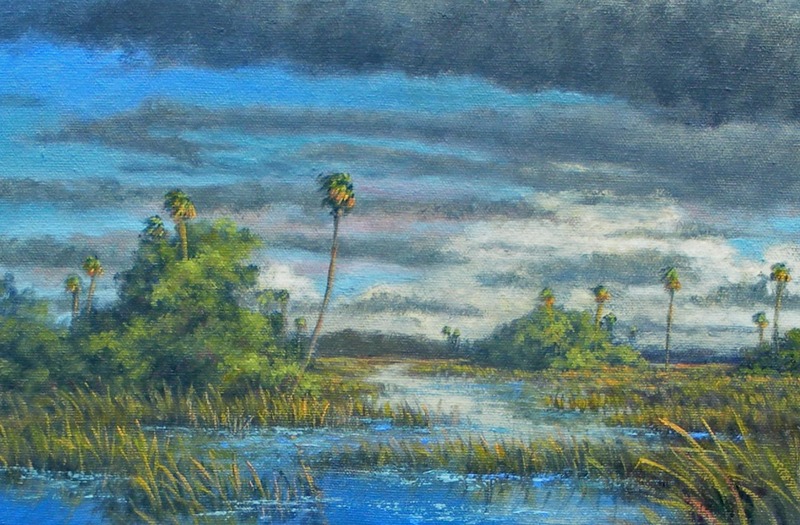 By-The-Way, I have been juried into Thornebrook Festival Sept. 29-30 and Ocala Arts Festival October 27-28. Most of the time I produce paintings for the "normal" sized home -- 16"x20", 18"x24", 20"x24", 24"x30", etc. So when I get a commission that is fairly large compared to my usual size choice I get a bit nervous. That is what I am dealing with right now. I recently delivered a 34"x28" commissioned painting to clients. They loved it an ordered a second painting - 30"x46". I realize many artists paint mural sized paintings on a regular basis, I just don't happen to be one of those artists. Come with me on my journey to produce this painting as I share the experience here on my blog. The process begins with stretching the canvas (no easy task), developing a composition (always a challenge), painting a "miniature sketch" for client approval and then tackling the painting itself.